Yes, it’s about two hours from Richmond to Portsmouth, Virginia. Yes, road-tripping to the beach with the kids in the dead of winter seems a little crazy. But the good news is once you arrive at the Children’s Museum of Virginia, you’ll be glad you made the trip. The better news is your kids will want to spend all day there. Children’s Museum of Virginia reopened last spring after nine years of planning and a two-year remodeling project. What was a building has been transformed into a spacious play-land where children up to about age ten can play and learn, dream and create – all while letting their imaginations run wild. My husband and I recently made the trek with our 6-year-old son and 4-year-old daughter and had a spectacular time checking out the sights. We began on the first floor, which is geared toward toddlers, preschoolers, and early elementary aged children, and has been designed to resemble a town. Highlights of our town tour included stops at a veterinarian’s office, where my daughter got a kick out of donning the vet’s lab coat and examining all the stuffed kitties, and a visit to the bank, where we pretended to deposit money in the teller window tube. Watching the tube zoom from one end of the room to the other was a hit with the kids. My son learned how to write a check from an oversized checkbook. He caught on quickly, writing out a $10,000 note to himself. We enjoyed a good laugh over that one. Two of Mom’s favorite stops were the mock grocery store, featuring a diner and a farm stand where children can learn about locally grown products and healthy eating while pretending to shop and check out just like mom and dad, as well as the faux fire station. Here, my kids tried on firefighter gear and practiced putting out a fire, and climbed aboard a life-size fire engine, all while learning about fire safety. Do your kids love vehicles? They can hop on a city bus or a police motorcycle and pretend to ride around town. The museum’s simulated city also features dentist’s and doctor’s offices, and a music store, where my crew loved experimenting with unusual objects like trashcans and flip-flops to create tunes. At the port-styled play area (this is Portsmouth after all!) they especially enjoyed roaming around in a tugboat, enveloping themselves in life jackets, and discovering life along the sea as they practiced using their hooks, lines, and sinkers for the various fish that call the Chesapeake Bay home. Exploration on the tugboat also taught them about water safety, the numerous types of watercraft that navigate along the Bay, and how to steer a ship. We ended our town visit with a stop at the World of Goods display, where children get a lesson on importing and exporting and can operate a crane as they transport goods on and off a train. 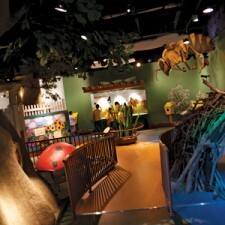 If your children enjoy role-play already, then a visit to the museum city is a must. If not, be prepared to get in on the action and help kids develop those important imagination muscles. But the simulated city isn’t the only draw on the first floor. If you’ve been before, you’ll be happy to hear that popular exhibits from the old museum remain, including the ultimate bubble room. Both children and adults alike will have fun playing in the bubbles and attempting to entrap themselves in a giant bubble. 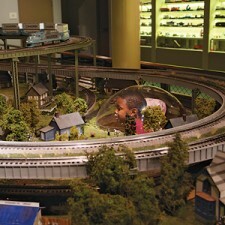 Meanwhile, Dad’s favorite attraction was the Lancaster Antique Train and Toy Collection room, which features five mobile tracks, a replica of a downtown Portsmouth depot, and model trains of all shapes and sizes modeled after real trains from across the commonwealth. For a better view, my children and husband loved crawling through a tunnel and popping up in a bubble overlooking the center of the depot. Parents of Thomas the Train groupies should plan to spend a lot of time in this room, as it also includes a separate play area with train tables for Thomas and his pals. Also on the first floor: a planetarium, birthday celebration rooms, a library, a gift shop, a tot yard where little ones under age three can learn and play, and a separate room devoted to a rotating exhibit. On the day we visited, we explored the life and culture of Australia, discovering the staples of the country in the Australian market and doing our best kangaroo imitations as we jumped around to see if we could leap as far as everyone’s favorite marsupial. The next exhibit slated for this space will celebrate the hundredth anniversary of the Girl Scouts. That’s coming in March. Next, we ventured to the second floor, where families will find exhibits which incorporate the Standards of Learning into the displays and are geared toward older elementary school children. 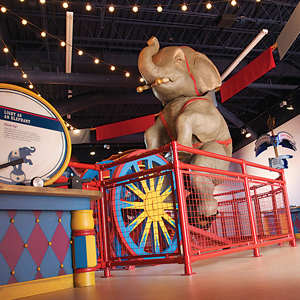 Science buffs will appreciate Dr. Force’s Traveling Energy Extravaganza, where children can roam various galleries under a carnival theme and discover the wonders of magnetism, energy, and electricity, as well as how water and air move and how different machines operate. My kids loved making and watching magnets dance in an exhibit by artist David Durlach called Dancing Trees as well as hoisting a life-size model elephant with a pulley. If you want your little ones to gain a better appreciation of the environment, spend some time in My Backyard and Beyond, an area devoted to learning about nature. Both my children and I enjoyed frolicking with oversized bumblebees and ladybugs among the daffodils and trees. We also pretended to be beavers as we crawled through a dam. Kids will learn about energy conservation and recycling here as well. 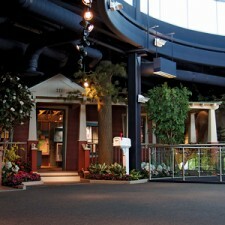 CreARTivity – the museum art studio – is perfect for young crafters. This area features a make-and-take self-exploration workshop where boys and girls can create with various art supplies and materials at their leisure. Kids can sketch, sculpt, draw self-portraits, build, and dress up and perform as if they are on Broadway. If yours don’t fancy themselves as performers, they can make puppets and put on a show in the theatre, or produce a movie with a zoetrope, a mechanical spinning device that uses a series of still pictures on a strip of paper to provide animation. This room was by far the favorite spot for my son and daughter, who didn’t want to leave at the end of our visit. We found that the museum staff members were dedicated to ensuring that the entire family was engaged in the museum experience. These folks also play host on Family Fun Days throughout the year. This winter, the Children’s Museum of Virginia has special family events planned for Martin Luther King Jr. weekend and the Chinese New Year. Families can come and go all day during their visit. Though no dining options are available on the premises, several family restaurants are available within walking distance along High and Water Streets. We didn’t have time to eat, but several staffers recommended Roger Brown’s Restaurant & Sports Bar, China Garden, and New York Delicatessen for family eats. Other attractions you might wish to hit while you are in town include the Courthouse Galleries for fine art, the Naval Shipyard, Lightship Portsmouth for sea buffs, and Olde Towne Portsmouth, a charming historical district. Next articleCan Sibs Be Friends?